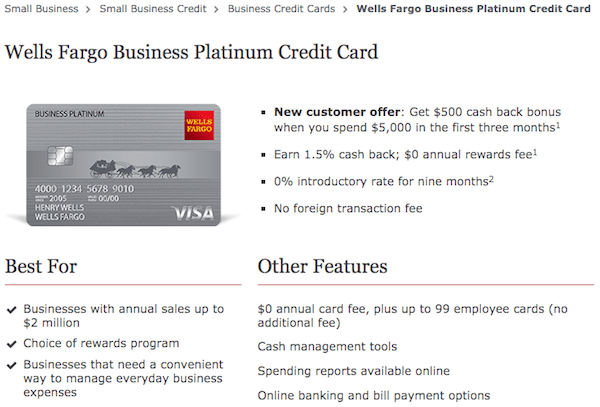 Wells Fargo is offering a $500 signup bonus for the Wells Fargo Business Platinum Credit Card. To be eligible you need to have a Wells Fargo checking -or- savings account that’s been open a year. While applying you can opt for a rewards scheme instead of cashback. I received a targeted offer for this that made it clear you could earn $500 cashback -or- 50,000 reward points, though it’s not 100% clear to me when applying online that when you opt for the rewards scheme instead of cashback you get a 50,000 point signup bonus. When you opt for rewards, you earn 1 reward point per dollar spent instead of 1.5% cashback. You also get 1,000 bonus points every month you spend $1,000+ on the card. And you get 10% back when redeeming points online. Note that this Wells Fargo Business Card Rewards program is distinct from the consumer GoFar Rewards. Though depending on how you interpret language on their site, you may be able to transfer rewards between business and personal accounts with the same owner. As is typical of rewards programs, most redemptions are worth a penny a piece. But there’s upside in air travel. They’ve got a quirky air travel award chart with redemptions up to 1.6 cents per point. Note that an airline ticket redemption fee of $24 applies even when booked online. 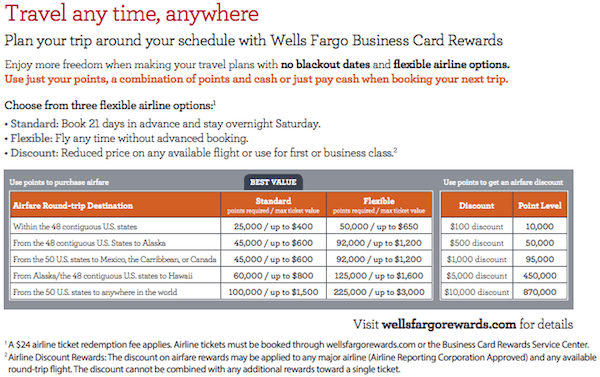 Here is a link to the Wells Fargo Business Card Rewards Program Guide. Q: How can I check whether I was approved? A: After applying online you can check your application status here. Q: Will the credit card appear on my existing online personal banking profile once approved? A: Yes, you should see it in your existing profile, though it may not be obvious you need to toggle between Personal and Business accounts. Q: If I wasn’t targeted and I opt for the rewards scheme are you sure I’ll get the 50,000 point signup bonus? A: No, I’m not. I don’t think we’ll know for certain until someone meets the min spend requirement and confirms. Q: Does having a mortgage for a year prior to applying qualify in lieu of checking/savings? A: The first question the application asks is whether you’ve had checking/savings for a year. If you answer no it kicks you out. I have just a mortgage with Wells Fargo and was targeted for the business offer. If you’re in the same situation you could either call and try to apply over the phone -or- say you do have a checking/savings account while applying with the thinking being they’re just looking for an existing relationship. That may risk the signup bonus though, so YMMV. Q: Will this business card count against Chase 5/24? 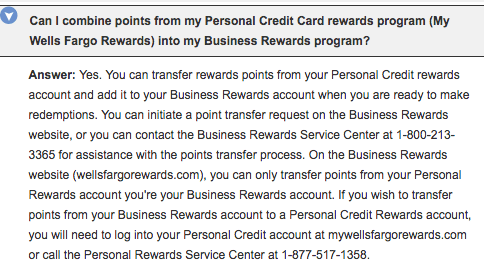 Q: Can I combine personal WF rewards with business WF rewards? A: Their site makes it sound like you can, so long as the accounts are in the same name. In general GoFar Rewards are transferable between any two accounts so this is an area ripe for exploration. Q: Does WF treat the waiting period between personal and business and bonuses separately? A: Good question. The T&Cs on their personal cards say: “If you opened a Wells Fargo credit card within the last 15 months, you may not be eligible for introductory annual percentage rates, fees, and/or bonus rewards offers.” So I’m not sure whether getting a WF business card will reset the clock on getting the signup bonus for a personal card. Please share datapoints if you have them. Q: On the landing page for WF Business cards I see an Elite card with a $1,000 signup bonus, what’s that? A: Good question. It’s for established businesses with over $1M in revenue, you can’t apply online, and it has a $25,000 min spend requirement. Let us know if you have any experience with it, especially it’s distinct rewards program. Looks like one of my 2018 Points & Miles Hopes & Fears has already become a reality: A compelling offer with an impossibly confusing rewards scheme from Wells Fargo. One down ten to go! Please let us know in the comments if you have any additional tips and tricks for maximizing the value of this card. No idea why but they don’t seem to want to deal with me. Wife was approved 10 minutes after application was submitted. Took the $500 option. Thanks for the links Robert! So do you see an inquiry on your credit report? If not you probably are banned. Good news is they did a pull (EX), bad news is they seem to have flat denied me. I messed around with some risky stuff (Like 100% utilization) in Nov/Dec and thought it had cleared up on my reports but I guess not. Will have to reapply in a month or two after my score returns to normal. How difficult is it to get a WF business card if you have a new business with no income? I have a WF personal checking account and for the last few years DD in from work from 3K to 5K per month. I can’t offer a useful datapoint since I was targeted, other than to say my small business income is quite modest and I was approved. If I were you I’d probably wait a few days to hear some datapoints then lob in an application if it looks good. Let us know how it goes if you do apply? Cheers. See above, but my wife who has very small business income was approved. I don’t currently have a WF account. Any idea if being added as a joint owner to a checking or savings account that has been open for more than 12 months will help bypass the requirement?